Every purchase you make, gives back to The National Center for Missing and Exploited Children. The air is crisp, the leaves have fallen and Mt. Hood is snow covered in the distance. Thanksgiving in the Pacific Northwest is a time for celebrating the simple joys of the season with family and friends. So whether you’re planning a rustic meal or intricately planned dining experience, Thanksgiving is truly a blessed time for families across America. 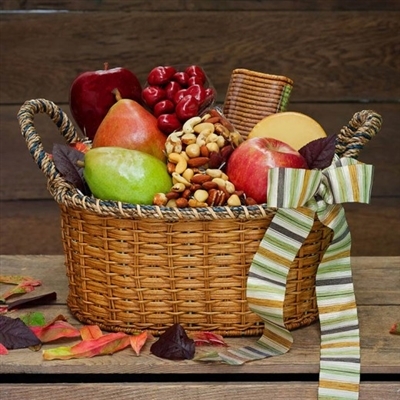 And what better way to share your appreciation for those you love than to send our beautiful Fall Basket brimming with a wonderful selection of apples, fresh pears, crunchy mixed nuts, smoked Gouda cheese, artisan honey wheat crackers and luscious chocolate covered cherries. 1 Chocolate Covered Cherries - 4 oz. 1 Mixed Nuts - 4 oz. 1 Smoked Gouda Cheese Round - 6 oz. Citrus cannot be shipped to California or Arizona due to agricultural restrictions. Pineapple cannot be shipped to Hawaii due to agricultural restrictions. Northwest-grown pears or apples will be substituted.